May 2016 - Perry Hood Properties, Inc.
There’s a long list of tasks you’ll need to finish in order to enjoy a stress-free move into your new home. While preparing for a move, however, many of us fail to make adequate plans for the tasks we’ll need to accomplish once we’re all moved in. Here are a few of the most important things to do once your move into a new home is complete. It’s a good idea to have an inventory list of boxes that should have made the trip from your old residence to your new house. If you have one, check that all the boxes made it safely. Be sure to check that they’ve arrived in good condition and the contents have not been damaged. Once everything is unpacked, check the boxes again to make sure nothing has been overlooked, then you can begin recycling or giving away your boxes to get them out of the way. 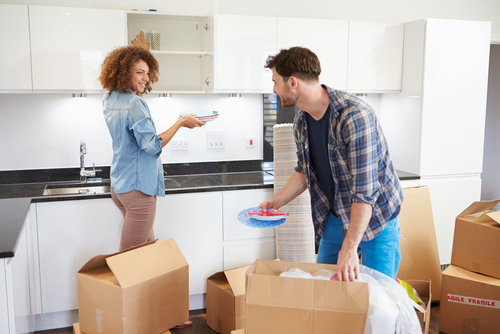 Moving can be an expensive process, but if you’re organized and in the right circumstances, you may be able to write-off some of your expenses on your next tax return. In order to do so, you’ll need to keep all the receipts related to your move, however. That means getting a receipt from your moving company, or for renting a truck, plus receipts for any packing materials you bought. If you rented a storage unit for short-term storage, you may be able to write that off as well. Immediately after your move, make sure all of these receipts are accounted for, and put them together in a safe place. If you’ve moved from out of state, you’ll have some registering to do in your new home. You’ll want to start by registering your vehicle and getting new tags and plates. While you’re at the DMV, you can also get your new driver’s license. You have a grace period to get this registration completed, but it’s a good idea to take care of it before you forget. In most places, you can register to vote in your new state at the same time. Before moving, you probably set up mail forwarding through the post office. Once you’re in your new home, it’s a good idea to check with the post office again to ensure mail is being forwarded properly. This would also be a good time to change your address on any important accounts you have, which would include any company who sends you a monthly bill, your bank, magazine subscriptions, and your office. If you’ve just moved across town, you may still be able to use the same emergency contacts as before. But, if you’ve moved farther away, you may need to do a little research to compile a list of who to call for certain emergencies. Get the local number to the nearest police station, hospital, pharmacy, and veterinarian if you have pets. You can also ask around and gather phone numbers for trusted plumbers, electricians and other workmen who you may need to call if something in your new home breaks suddenly. There’s plenty more to be done once you’ve moved into a new home, but these tasks will get you started on your to-do list. If you’re moving in Tulsa, Broken Arrow or Bixby, contact us at Perry Hood Properties. We can build a house for you, or offer you a move-in ready, recently constructed home in the best neighborhoods in the area.